A Qantas jet turned back to Singapore Friday after encountering engine problems shortly after take-off according to Australian Transport Safety Board spokesman Neville Blyth. 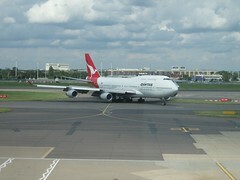 This makes the second jet in two days from Qantas that had to return to Singapore due to engine problems. Friday’s incident involved a 747-400 that carried 412 passengers and 19 crew and was bound for Sydney, Australia. No one was injured as the plane returned safely to the airport. On Thursday, Qantas had an emergency landing of an Airbus A380 at Singapore’s Changi Airport after one of its four engines shut down minutes after take-off. During its return pieces of the engine’s cowling tore off and fell to the ground. The Australian Transport Safety Board said it has sent investigators to examine the cause of the engine failure on Thursday’s Airbus A380 and is still gathering information about Friday’s incident.